A Distressed Sailor, Thomas Rowlandson, 1788 (published 1789), Royal Collection Trust. 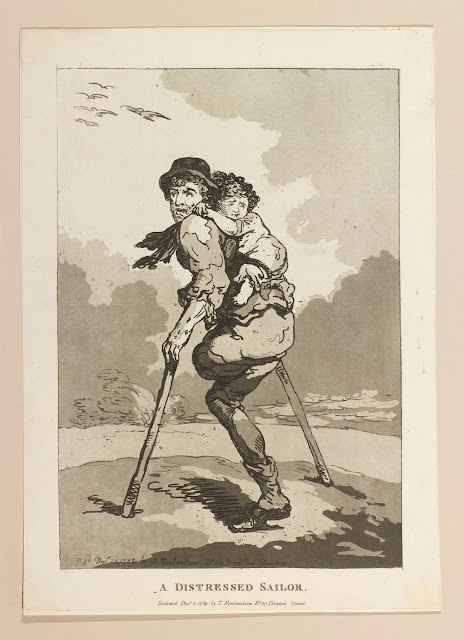 The 1780's saw a rise in the number of prints and works calling for reform in the care of disabled and aged sailors. Rowlandson's "A Distressed Sailor" is an emotional appeal to the viewer to do something to help the man who had lost his leg in their defense, while supporting a child both literally and figuratively. Our poor jack wears a narrow brimmed round hat and short curly hair. His neckcloth is black, and his ragged jacket has slash cuffs with cloth covered buttons. At first glance I thought he was wearing a pair of trousers, but a closer look shows that it is a pair of breeches, gathered about the knee of his one good leg. His stocking hangs low around his shoe, which is tied rather than buckled.